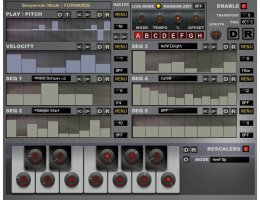 A collection of Multi-sampled Instruments designed on a Virus TI now released for Sampletank. These are a high quality selection of musically useful sounds which make the most of Sampletank via a series of 44 child presets for each instrument. These child presets are like categories which transform each instrument adding a ton of flexibility to the collection. AMB A/B/C These are a collection of Ambient Presets. GRAIN A/B Use sampletanks timestretch mode. MELLOW A/B Mild Ambient style. TWANG A/B Bright Short Decay styles. UPFRONT A/B Compressed upfront variations.